Hey everybody, it's Truffles! To wrap up Adopt a Cat Month we wanted to tell you about a few new children's books that teach kids the importance of responsible pet ownership. Giveaway copies are available for all of them, too! In Carmella the Cat readers find out how Carmella, a stranded, orange and white tabby kitten, was rescued and adopted into a loving fur-ever home and what it means to be responsible for another living being. 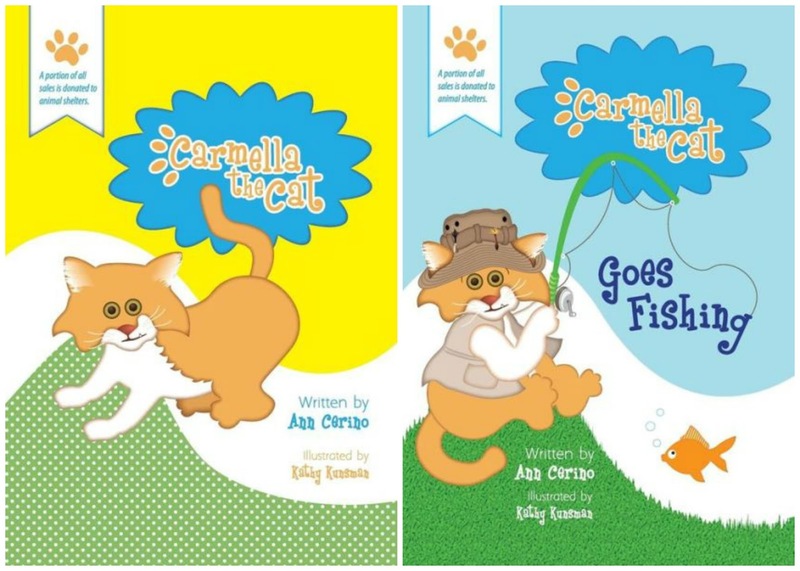 In the second book in the series, Carmella the Cat Goes Fishing, kids learn about being a patient pet owner, as Carmella explores her new environment! Each book is written by Ann Cerino, illustrated by Kathy Kunsman, and retails for $12.95. 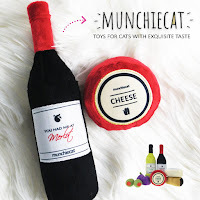 A 10% portion of the proceeds goes to local animal rescue organizations in the Lehigh Valley, PA area, which is where Ann is from. Additional books in the series will be launched in 2016 and beyond. The Carmella the Cat series is based on Ann’s cat, the real Carmella. Carmella was found, along with her littermates, in a flooded drainage ditch, and was the only kitten to survive. She was rushed to “The Cat Doctor,” Dr. Ackerman, who helped save her life by treating her until she was healthy and ready to be adopted. When Carmella was well, Dr. Ackerman introduced the tiny kitten to Ann, who had recently put her cat to sleep, and a loving, fur-ever match was made. 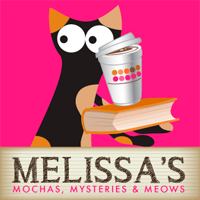 I recently had the opportunity to chat with sweet Carmella and ask her a few questions about her life and book series. Truffles: Welcome, Carmella! Thank you so much for taking a few moments to chat with me. Could you start by telling us a little about yourself and how you came to live with your human? 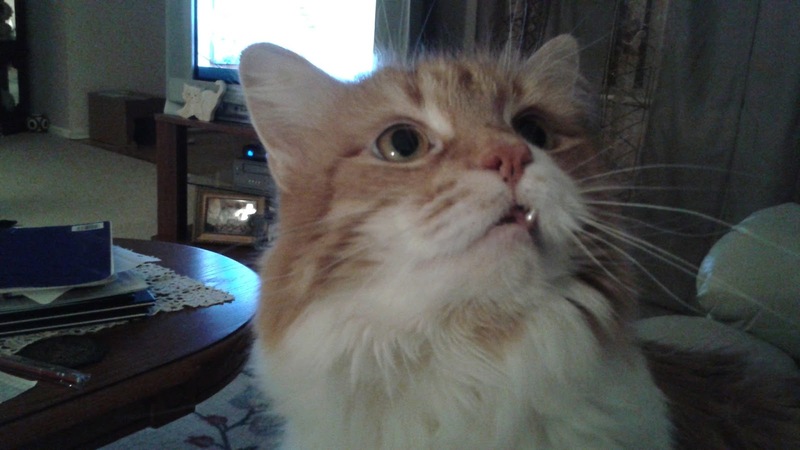 Carmella: I was adopted by my Mom when she was at her vet's office. The Cat Doctor saved my life and when Mom saw me , she fell in love with me immediately. I still needed some care then went home with Mom 2 weeks later. Your name is very beautiful. Does it have any special meaning? My name in Italian means "garden". The Cat Doctor wanted a name that was flowery. I am also the color of caramel candy. Please tell us about your sweet children's books and what inspired you to write them. Mom wrote the books because she wanted to share my story and it's happy ending. What do you hope kids learn from them? We want everyone to know it's important for all animals to have a "Forever" home. We have four more books to publish. After such a rough beginning, what's life like for you today? My life now is the BEST! I am the Queen of the house! I just celebrated my 9th birthday last week! Connect with Carmella online on her website, Facebook and Twitter! The Perfect Place For Toodles tells a story of a very young cat that experiences abandonment and great loneliness more than once. He thinks he has found a permanent home with a loving family. Life is good for a time, perhaps too good. After a while the cat is left to spend many long hours in a window waiting and watching for his family to return. While there are still some fun moments with his adopted family, Toodles gets the feeling of being left out. Things really take a turn for the worst when an annoying neighbor visits more often and pays a lot more attention to the cat. 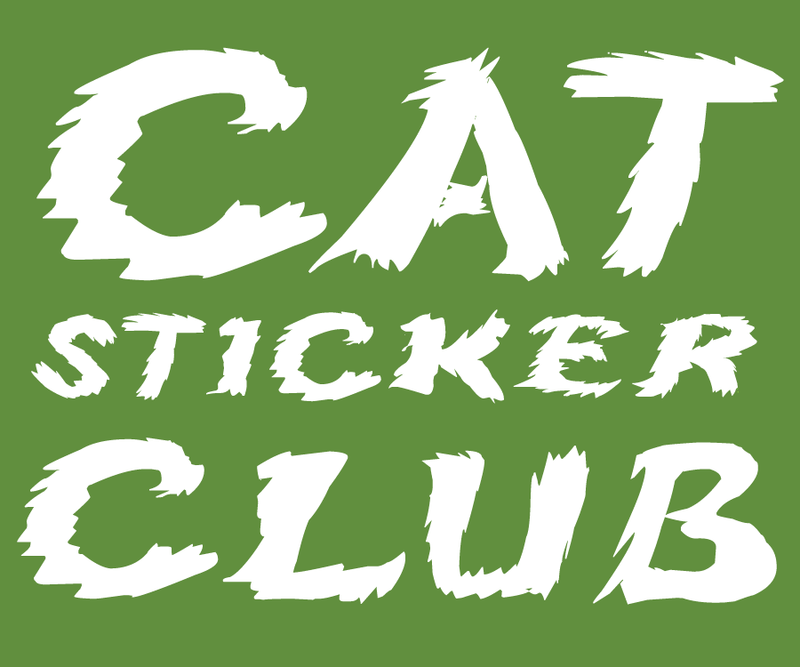 When the cat is devastated by some shocking news, he makes a serious move to direct his life in a different direction. The inspiration for Toodles’ story resulted from author Barbara Pierce’s visit to the Jersey Shore, where she found a large commune of stray cats living under the boardwalk. “My eyes were really opened to the plight of some animals,” Pierce said. I found the ending to be incredibly sad, but unfortunately it's a very realistic look at what happens to so many family pets when kids "don't have time for them anymore". I guess that is the ultimate lesson...don't get a pet if you aren't in a position to be the best pet parent possible for their entire life. We bet many owners are guilty of not spending enough time with their cats! Lots of times we look at our human, our eyes dancing with fun and devilish humor. Our message, "please to play with you NOW!" has got to be purringly clear. But does she respond? No! Many times she goes into that room called the office and works! We're going to want this book so we can show it to her! Paws up. What a great idea to teach children about cat adoption and compassion for animals through books. The animal books I knew growing up were the Richard Scarry and Dr. Seuss variety. They taught things, but not necessarily about animals. These look like great books! The best things can happen when children learn and speak from love and understanding. These are excellent books. It's great to begin teaching humans at a young age about pet adoption and what that means. Great interview and that sounds like a great book. I liked on Facebook and am now following on Twitter. 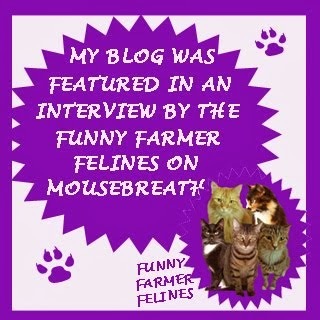 We love your interviews, Truffles! We're entering because we would love to add one of these to our collection. Our email is lolatherescuedcat@gmail.com. These are precious! 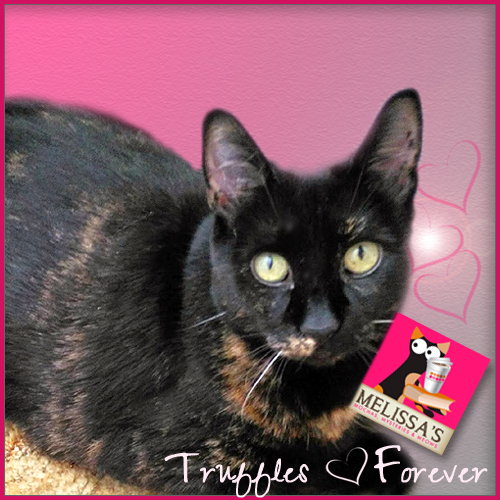 Thanks, Truffles and Melissa. These sound lovely and the greatgrands would adore either! The Carmella books sounds wonderful. I don't like sad stories, but I'd gladly take the other book if I win, too. I know that it is important for kids to learn hard lessons, even if they are sad. We have always gone to shelters for our kitty babies except one, she was our favorite. She was given to us by someone who didn't want her anymore:( She lived with us from 3 years till she passed when she was 20. She was the best baby and is always in my heart. Thank you for this story and books giveaway. Love your blog. These books sound wonderful! It's horrible that so many cats and other pets are treated so poorly by humans. Books like these are a great way to instill values in children. 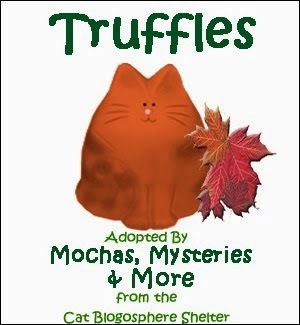 Those sound like pawsum books Truffles. Teachin' children is da bestest, cuz they will be da pet owners of tomowwo, and we hope they do better by us than todays adults. I would love to win copies of these for my wife's classroom. She incorporates caring for all creatures in her lessons. The importance of pet adoption is something every kid needs to learn! Kudos to Ann for helping make that happen. those sound darling but please don't enter me, you KNOW I have way too many to plow through!!! (wink) Those ARE adorable though!